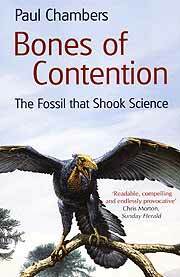 The book, the Bones of Contention sports the subheading on the cover - The Fossil that Shook Science (ISBN 0-7195-6059-4) and is written by Paul Chambers and published in paperback this year. Since I have always been fascinated by the Dinosaur era and just how did the dominant species just disappear off the face of the earth, I was interested in this book from the outset. Quite frankly, I have always wondered just how do we find dinosaur footprints, when all my mud footprints seem to disappear after the first shower of rain. My size 8’s will not be around to be discovered in the next 260 million years or so. In fact, 260 minutes seems to be closer to the average life span! This is a book in which you should read the preface first, as it sets the tone for the pages to come. Author Chambers, himself a micropalaentologist, states that the fossil of Archaeopteryx has ruined careers, bankrupted rich people and made highly esteemed organizations look stupid. Not bad for a 150 million year old fossil found over 150 years ago. 150 years ago was also when the Darwinian theory was the hot topic of discussion in scientific circles and Chambers takes you directly into these, with a reportage style giving the impression that the author was really there. Clever writing indeed. The significance of Archaeopteryx came about because it seemed to be a crossover between reptiles and birds, and the Darwinian group immediately saw this a fossilized proof that species could undergo a change. The anti-Darwinian group had then to either deny its existence, decry it as a hoax or otherwise deal with the problem that had arisen. Chambers does also look in detail at another bird-slash-dinosaur, that was called Archaeoraptor. This beast was hailed as the final link to show that dinosaurs became birds, but unfortunately was found to be as elaborate a hoax as the Piltdown man. The interesting part of the tale was finally found to be the tail, which came from another animal entirely, and whilst some researchers could be pardoned for being excited at the find, they cannot be pardoned for being somewhat sparing with the truth. The money that comes from media exposure can blind even the most erudite scholars. The scientific community is also subject to bias, and with the evolution process, personal bias very soon sways objective thought, forcing conclusions that may be incorrect, but yet for all the ‘right’ reasons. The review copy was made available by Bookazine and it has an RRP of 450 baht. I found it totally readable, and as author Chambers desired, it is not at all overly scientific textbook in style. In many ways it is a detective story, but using real life (or real dead) evidence. If you are interested in dinosaurs, you will like this Jurassic lark (sorry, I couldn’t help myself). Footnote: The above ‘detective story’ reminds me that there is a new website on the net for fans of Christopher G Moore’s Vinnie Calvino series. Go to www.vincent calvino.com and see how the slightly seedy PI is doing! First, I am sure you noticed, this dog usually gets his capital letters in the right places. However, those young pups from flow do not like to use capital letters in their name and CD titles, and who am I to argue? After all, the Beatles couldn’t spell. flow’s second album in their trilogy (seeds, roots, and flowers), roots comes two years after the first album and confirms flow as one of Thailand’s leading rock bands, although only Mit Witchitwatee was born in Thailand; the rest of the band has made Thailand their home. In all departments of their trade, flow has come on in leaps and bounds. Out the front, when flow takes to the live stage, is Rick Montembeault. As well as being the sole songwriter in the band, he also possesses one of the most unique and emotive voices in Rock ‘n’ Roll. Rick’s collection of songs flow beautifully throughout the album. Opening with the introductory ‘flow river flow’, which builds from a quiet beginning allowing each member of the band to slowly integrate themselves into the song. Straight away it is thrust into your ears. The regular gigs all over Thailand have made the band tighter and their confidence is infectious. The rhythm section of Peter Fleischhaker with Mit Witchitwatee fair punch each song, Peter playing his bass guitar in the more modern style, like a lead instrument, rather than traditionally as a rhythm instrument to underpin the song (especially on the rocky ‘easier to be gone’). Mit Witchitwatee’s drumming is also pushed right to the front of the mix. If his funky drumming was a feature of seeds, then he excels himself on roots, cementing his place as Thailand’s drummer’s drummer. On lead guitar and star of the live set is the man with more nicknames than he can remember, Roland Fleischhacker, a.k.a. ‘The Character’, or to most of his friends ‘Breez’. Breez’s (see, Mott the Dog’s a friend) guitar playing throughout is exemplary and is the only lead guitarist that flow could ever have, as he manages to play in all the different styles that Rick Montembeault’s songs demand. You are never going to get bored listening to a flow album. Even through this one Breez’s playing leaves you in no doubt that you are listening to a collection of flow songs. One of my small gripes about this set is that Breez is only once allowed to blow up into a hurricane with his axe playing (during ‘hey old man’). For two and a half minutes Breez rips through his strings bringing the song to a roaring climax. I hope on the final piece of the trilogy Breez is given a little more rope to let it all hang out. It certainly would add so much more excitement to proceedings. Unfortunately third song in ‘non-song’ is exactly as the title suggests, and perhaps could of been left on the cutting room floor. It sounds a bit like an outtake from seventies spoof band Alberto Y Los Trios Paranois, thereby incurring the loss of half a star. But this is more than made up for by what follows in ‘the money song’, ‘then there’s me’ and the amazing ‘wooden indian’. They are the central songs of the set and are by far the best songs ever to come from the pen of Rick Montembeault. If you had to pick one song it would have to be ‘wooden indian’ with its Led Zeppelin influences flying high. Hey, everybody has influences; best to get them from the top. ‘wooden indian’ is a tribute to native North Americans. It is hard to think of a better crafted song in the world of rock music and is worth the price of the CD on its own. To add to the splendor the talents of ‘Life After Nine’ (whose debut album ‘Stomp’ is a must for any lover of good time music) violinist Steve Cipolline have been used on the song, giving flow’s sound a whole new dimension. Showing complete unity with Thailand’s musicians, the multi-talented keyboard player Keith Nolan of ‘Cannonball’ has also gainfully been employed. Now there is an idea, next time flow graces Pattaya or Chang Mai with a concert, perhaps they could bring these two with them. Now that would be something to behold. “Money makes the world go round, But why? Great stuff, Doubloons indeed. Music to tap your foot to and put a smile on your face. Final song ‘the wheel keeps turning’ brings the whole set to a rousing conclusion. The album comes in a gatefold digi-pack with a separate booklet with lots of photos, all the lyrics and as much information as you are likely to need on the band, all designed by long time flow stalwart Richard Wilson. All in all a very nice package. I look forward to the final chapter of the trilogy - flowers. 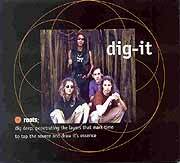 As flow say, roots - dig in and dig it.